The weather in Zante does not disappoint. Known for its dry summer heat, warm nights and much-needed sea breezes, Zante is the ideal spot for your next summer holiday. Summer in Zante stretches from May to September. Day time temperatures regularly exceed 30°c, so pack that factor 50 if you’re heading out in midday heat! Sunscreen is particularly important given that the island welcomes a cooling sea breeze in the summer months, often making the heat feel less intense than it actually is. You’ll find sweet relief from the intense heat of Zante’s summer from May to June, with sea temperatures of between 23-25°c. The sea heats up later in the season and can feel like swimming in a warm bath, with temperatures hitting a peak of 26°c in August. Either way, swimming in the Ionian Sea is sure to be a highlight of your trip, complete with fantastic snorkelling spots and awesome water sports, making your holiday a one to remember. Although it cools off in the night time, you can still rock the vest and flip flops. Temperatures around the early twenties are typical for evenings in the summer months, so you can be sure that there’ll be no night time chill dampening your party. If you’re planning to head to Zante outside of peak season, spring is a great time to miss the rush. From mid-March to May, the weather is pleasant and rain is intermittent, so you can enjoy the Greek island without the crowds. 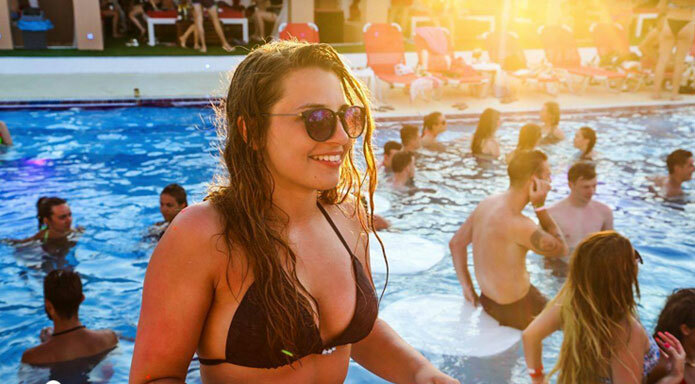 The warm weather may seem exciting, but for British partygoers who are typically not used to the sun it can also be dangerous. Zante is one of the hottest islands in Europe and heat stroke can occur if you don’t keep up your fluid intake (beer doesn’t count!) Sunburn, which may seem like a light issue, can be severe if you don’t properly protect your skin. Respect the heat in order to properly enjoy it.